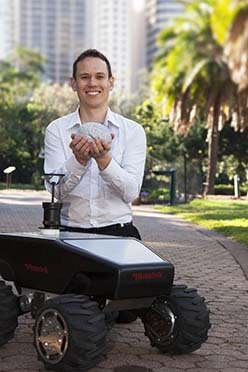 Dr Michael Milford with one of the all-terrain robots to benefit from brain-inspired modelling. Computer modelling of the human eye, the brain of a rat and a robot could revolutionise advances in neuroscience and new technology, says a QUT leading robotics researcher. “This is a very Frankenstein type of project,” Dr Milford said. “It’s putting two halves of a thing together because we’re taking the eyes of a human and linking them up with the brain of a rat. “A rodent’s spatial memory is strong but has very poor vision while humans can easily recognise where they are because of eyesight,” he said. “We have existing research, software algorithms in robots to model the human and rat brain. The research has been published in the British journal Philosophical Transactions of the Royal Society B. “The brain’s spatial navigation capabilities degrade early in diseases like Alzheimer’s,” he said. He is one of Australia’s leading experts on developing technology to visually recognise locations and is chief investigator at the QUT-based headquarters of the Australian Research Council Centre of Excellence in Robotic Vision. “Current robotic and personal navigation systems leave much to be desired,” he said. Dr Milford said drivers could miss or take the wrong exit because personal navigation systems didn’t work in tunnels because there was no satellite signal. “That’s an example of one of many ways we’d like to create really cool, useful technology,” he said. April 8, 2019 - Humatics, Vecna Robotics partner to improve logistics robot navigation Robot ReportYour browser does not currently recognize any of the video formats available. Click here to visit our frequently asked questions about HTML5 video. April 16, 2019 - Google robotics could focus on navigation, machines moving from place to place CNETRobots that run and jump are “crowd pleasers,” the company's robotics chief says. April 17, 2019 - Mush! Watch a team of Boston Dynamics' SpotMini robot dogs pull a truck down the street USA TODAYBoston Dynamics' four-legged SpotMini weighs 66 pounds, can carry up to 31 pounds and run for 90 minutes. A team of the robot dogs can pull a truck.